A 3" tall silver-plated bell, two triquetra and Celtic knotwork designs engraved into its opposing sides. 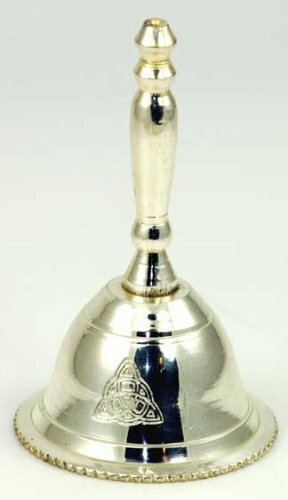 The perfect size for use on an altar or in your ritual space, the airy chime of this bell is reminiscent of a bedside bell, useful for calling aid when you need it. If you have any questions about this product by Raven Blackwood, contact us by completing and submitting the form below. If you are looking for a specif part number, please include it with your message.